Techies Sphere: How to configure logs settings in Symantec Endpoint Protection Manager (SEPM)? How to configure logs settings in Symantec Endpoint Protection Manager (SEPM)? Or, How to Change Logs Settings in Symantec Endpoint Protection Manager to keep 30 days, 60 days, 90 days or xyz days logs in server? 2. Scroll down to lower left and click on Servers. 3. 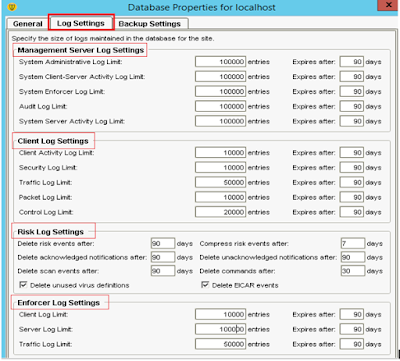 Select Local Database or the Choose any Database you want to configure for logging. 4. Under Tasks click on Edit Database Properties.